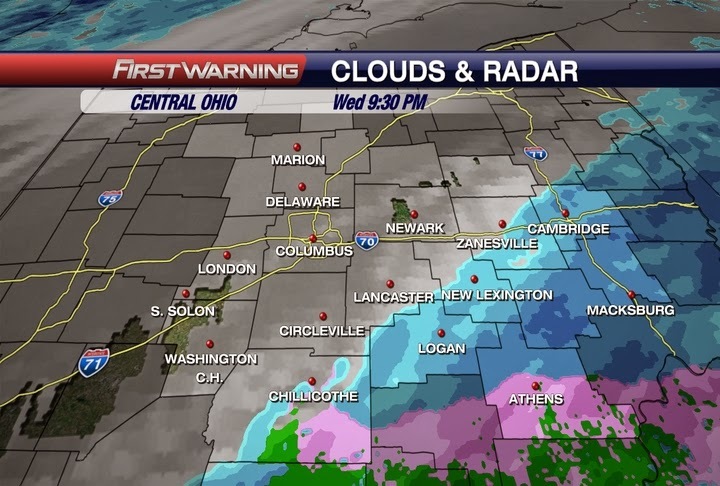 Some light snow moved through this evening. Not amounting to a whole lot, but enough to dust parts of the area and reduce visibilities at times. Another round of light snow expected for overnight. North of I-70 could see a little more than half an inch, but areas to the south will generally see less than half an inch. Soooo, shouldn't cause to many problems, but even a little bit will cause some slippery spots. Then we dry out for a few days and warm up. 40's for the highs for Saturday and early Sunday. Temps fall through the day Sunday and then a weak disturbance will bring some light snow for Sunday night. Again, looking on the lighter side of accumulations, but keeping an eye on the middle-end of next week. We could have another decent snowfall according to the longer run models, but still a ways out. More on that in the days to come. Until then, I hope you continue having a happy holiday season and have a good one!